It was the best of times, it was the worst of times, it was the age of wisdom…. it was the epoch of belief, it was the epoch of incredulity, it was the season of Light, it was the season of Darkness, it was the spring of hope, it was the winter of despair, we had everything before us, we had nothing before us…..
Charles Dickens’ opening line in “A Tale of Two Cities” described the moments perfectly, though in my world, those moments don’t necessarily happen simultaneously. On this day, the “worst”, the “darkness”, the “despair”, the “nothing” was all together – the return of my symmetry with the “best”, the “light”, the “hope”, the “everything” would come a few months later. In February 1997, I was about four months pregnant and loving it. Pregnancy agreed with me. I had a miracle inside, and even though it wasn’t a secret, it felt like it in a way. All mine, for now – I would share the baby later – but today, it was all mine and I felt a smile inside all the time. Best, light, hope, everything before us. No words express it all, really. One Saturday night, I started bleeding. Panicked, I woke my husband. We called the doctor, who advised me to stay in bed and call first thing in the morning. We called first thing in the morning, Sunday morning. Doctor said for me to stay in bed all day, and come to the office first thing Monday. I was frantic and I was sad. Worst, darkness, despair, nothing before us. Really, I had no idea what this event might mean, but “for this child I had prayed” (1 Samuel 1:27), and nothing escaped the Lord’s notice. He was forming this baby in the womb and He KNEW this baby, even now (Jeremiah 1:5). I went to the Lord and to His word for comfort. I’m not a “random” person – I’ve heard the same stories you have about the Bible falling open to the right page at the right moment to the right verse. I believe those stories – it just isn’t how the Lord deals with me. He knows my type-A-ness and He parents me in a way specifically suited for me. On this night, though, I couldn’t hear and I couldn’t see through my tears, I just held my Bible, and opened it. I saw Isaiah 44:3 and the following verses immediately. When I read that the Lord said that He “will pour My Spirit on your descendants And My blessing on your offspring”, I felt an immediate peace. I accepted this promise, leapt off the page, as mine, and went back to bed. I can’t remember how I slept, but I know the Lord gave me sleep that night (that’s a promise too – Psalm 127:2). We went straight to the doctor, first thing in the morning. She listened for a heartbeat, and we were listening too, barely able to concentrate for the sound of our own rushed heartbeats, Michael’s and mine. Oh relief! She found it – can you hear that, there it is, the baby’s heartbeat and it’s strong! Mercifully, the baby was fine. Thank You, Jesus, the baby was fine! Once again: best, light, hope, everything before us! The symmetry I long for restored. In February 1997, we only knew about one baby. Back in the dark ages, doctor’s offices didn’t always have their own ultrasound machines. In March we’d be sent to the hospital for the one ultrasound our insurance would cover. Hopefully we’d be able to find out the gender while the technician counted fingers and toes and measured limbs. Imagine our surprise: it wasn’t only one baby, but two! Two boys! I forgot all about the scary weekend last month – I had two boys! “One will say, I am the Lord’s; Another will call himself by the name of Jacob”. It still takes my breath away to read it, and let me tell you why: Baby A (the firstborn) is Tyler, and Baby B (the second) – his name is Jacob. 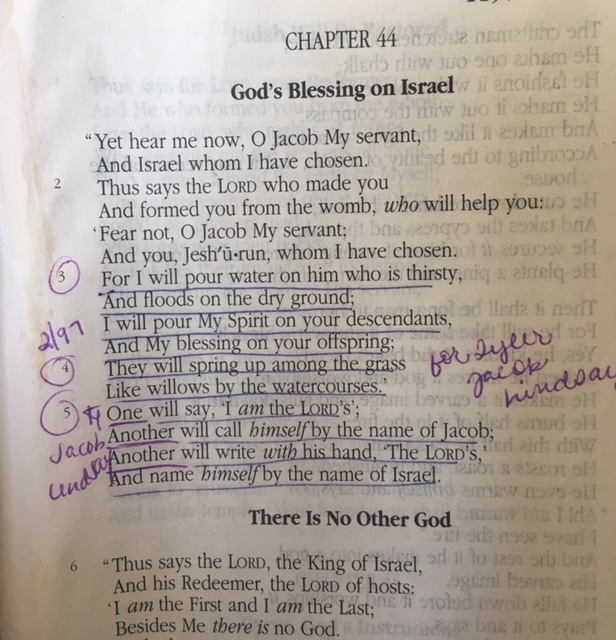 Reading it right off the page, I realized: on that evening, comforting me, the Lord didn’t only know the child that I knew about – He knew that there were two of them, and He even knew their names. How precious. How humbling. Later, the doctor would explain to me why she had me stay home instead coming to her right away: she “knew” that the baby was already lost she said, and she wanted to give me one more night’s sleep before breaking my heart with the worst possible news. Funny, how we humans explain things. She was giving me one more night. Really, it was God who was giving me one more night – one more opportunity to hear His voice and experience His peace. He knew that this memory would sustain and encourage for years to come. It was His gift, and it continues even still. To know His voice, you must know His Word – He never contradicts Himself. Read the Word on the good days, so you can remember the Word on the hard days. I can look back at this and know beyond a shadow of a doubt that the Lord is real and alive and present and invested in me. Can I tell you one more thing about the Lord before we close today? He’s “no respecter of persons” (Acts 10:34). That means that He loves everyone the same and shows no partiality. He doesn’t only speak to me through His Word – He speaks to all of us. What s beautiful, wonderful story of God’s grace. I love you so much!! !